Liven up your holiday cookie tray with CHOCOLATE CHIP BUTTER PECAN COOKIES! Nutty, chocolaty, chewy, and buttery too! 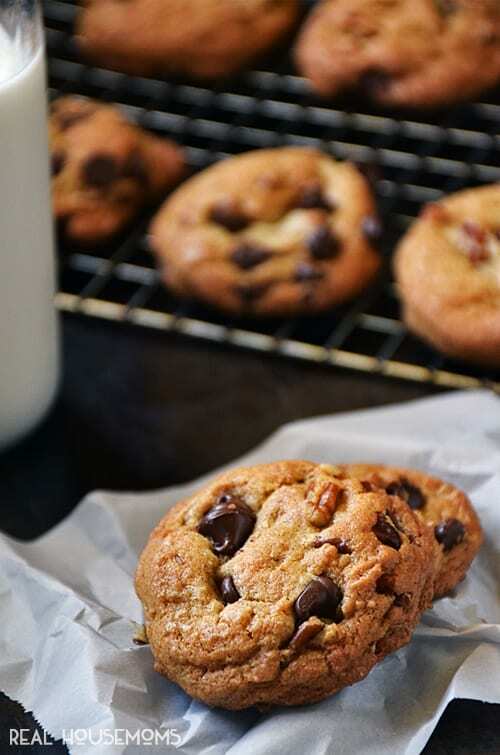 My favorite chocolate chip cookie recipe is even better with the addition of buttered pecans. 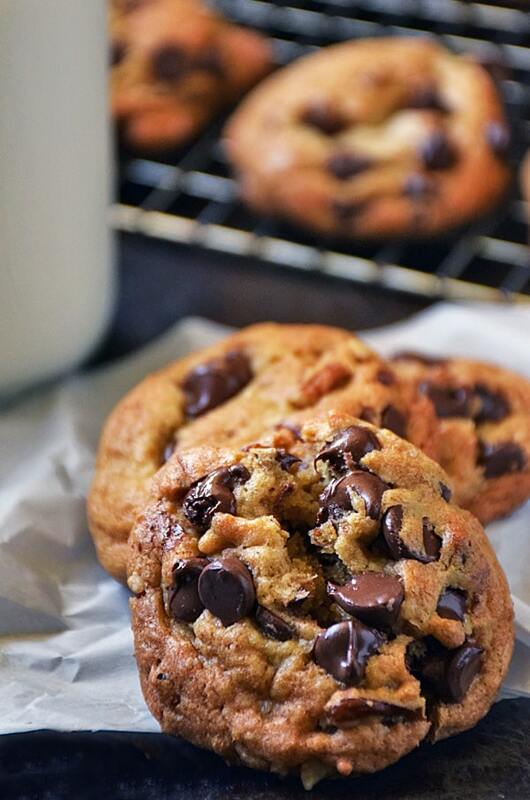 This is my favorite chocolate chip cookie recipe. I love the texture of these cookies. Because these cookies use bread flour and have more brown sugar with just a small amount of white sugar, they are softer and chewier than the traditional chocolate chip cookie that can be a bit on the crunchy side with a gritty texture. By reducing the white sugar, the grittiness is pretty much gone resulting in a smoother texture. I like that! We can thank Alton Brown’s baking genius for this wonderful recipe. I changed up his recipe ever so slightly and added buttered pecans. Adding buttered pecans to this chocolate chip cookie recipe is easy and only takes about 5 extra minutes. It is totally worth the little bit of extra effort to dress up this recipe making it a special surprise on your holiday cookie tray. These cookies are loved by all and make a great holiday gift too! Enjoy! TIP: This dough will keep in the fridge. I like to make just what we’ll eat because chocolate chip cookies are best nice and warm fresh out of the oven! It is quick and easy to scoop some dough on the cookie sheet and pop it in the oven when you take dinner out. That way you’ll be enjoying the ooey gooey deliciousness all night long. Freezer tip: I like to make up a batch of these and scoop them onto the parchment lined cookie tray and place in the freezer until firm. Then I store them in a zip top bag in the freezer. When ready for cookies, I remove just as many dough balls as needed and place them on a parchment lined cookie sheet. I usually let them thaw a bit and then bake them in the oven at 375 until golden brown. This dough freezes great!! Get more great recipes like this one on our Best Dessert Recipes pin board! Follow Real Housemoms’s board Best Dessert Recipes | RH on Pinterest. Liven up your holiday cookie tray with Chocolate Chip Butter Pecan Cookies! 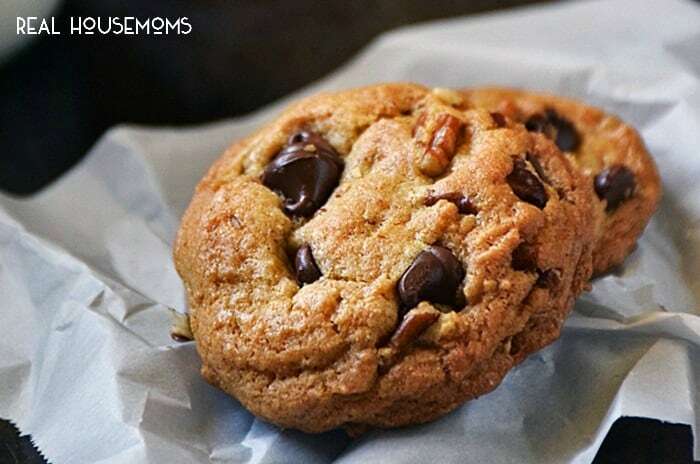 Nutty, chocolaty, chewy, and buttery too, my favorite chocolate chip cookie recipe is even better with the addition of buttered pecans. Melt 2 tablespoons butter in a small skillet over medium heat and add 1 cup chopped pecans. Cook about 5 minutes until the pecans are toasted and fragrant. Remove from heat and set aside. In a large mixing bowl, add 2.5 cups bread flour, 1 teaspoon salt, and 1 teaspoon baking soda. Whisk to combine and set aside. Melt 2 sticks of butter on the stove-top or in the microwave. Combine 2 sticks melted butter, 4.5 tablespoons sugar, and 1 cup packed brown sugar in the bowl of a food processor and pulse until mixed well. Or use a mixer. With the food processor running, add in 1 large egg, 1 large egg yolk, 2 tablespoons buttermilk, and 1.5 teaspoons vanilla. Turn off food processor after last addition. Add the sugar/butter mixture to the flour mixture and stir by hand just until combined. Fold in 1 cup buttered pecans and 1 cup semi-sweet chocolate chips until incorporated throughout the dough. Cover and chill dough in the fridge at least an hour, but I recommend chilling overnight for best results. When ready to bake your cookies, preheat the oven to 375 degrees F. Using a cookie dough scoop or a full tablespoon, scoop dough onto a parchment lined baking sheet. Bake in oven for 9-11 minutes or until your cookies are golden brown. Let cool on tray for a minute or 2 and then transfer to a wire cooling rack. Enjoy! TIP: This dough will keep in the fridge. I like to make just what we'll eat because chocolate chip cookies are best nice and warm and fresh out of the oven! It is quick and easy to scoop some dough on the cookie sheet and pop it in the oven when you take dinner out. That way you'll be enjoying the ooey gooey deliciousness all night long. Be sure to check out my basic cookie dough recipe that makes 5 different cookies from the same dough! 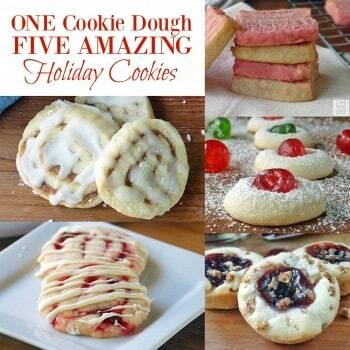 So easy to get all of your holiday baking done with just one cookie dough! I'm the chief cook, bottle washer, recipe developer, photographer, writer, social media crazy person, and founder of Life Tastes Good. I'm the wife of the luckiest man in the world (hehe), and mom to our amazing daughter who left us with a very empty next when she went to college.